Baystate Noble Hospital received the American Heart Assoc./American Stroke Assoc. Get with the Guidelines – Stroke Silver Plus Quality Achievement Award, recognizing the hospital’s commitment to ensuring stroke patients receive the most appropriate treatment according to nationally recognized, research-based guidelines backed by the latest scientific evidence. Baystate Noble Hospital earned the award by meeting specific quality-achievement measures for the diagnosis and treatment of stroke patients at a set level for a designated period. These measures include evaluation of the proper use of medications and other stroke treatments aligned with the most up-to-date, evidence-based guidelines with the goal of speeding recovery and reducing death and disability for stroke patients. Before discharge, patients should also receive education on managing their health, get a follow-up visit scheduled, as well as other care-transition interventions. According to the American Heart Assoc./American Stroke Assoc., stroke is the fifth-leading cause of death and a leading cause of adult disability in the U.S. On average, someone in the U.S. suffers a stroke every 40 seconds, and nearly 795,000 people suffer a new or recurrent stroke each year. 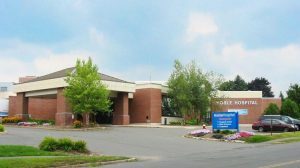 Congratulations to Baystate Noble Hospital on their recognition!